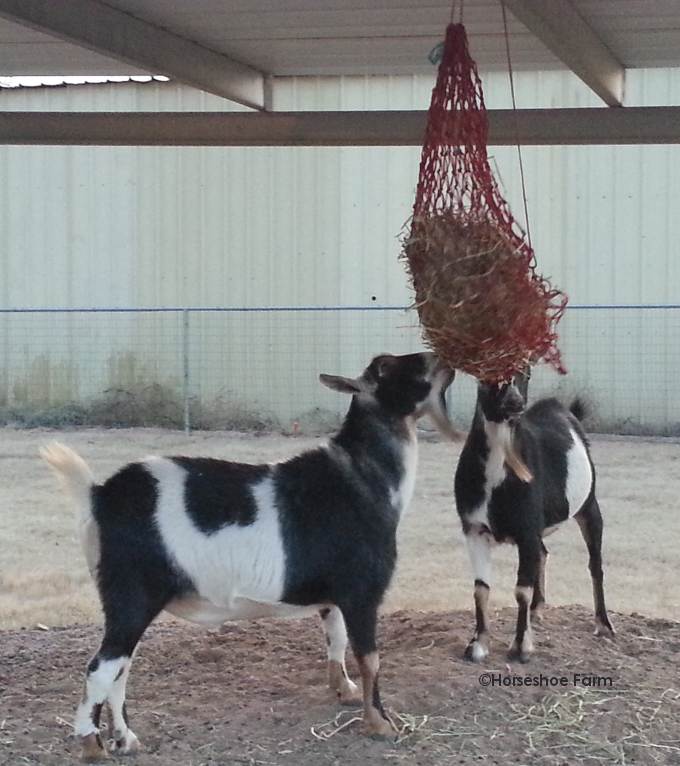 Awhile ago, I posted some photos of my goats playing with their water jug goat toy. It’s one of our most popular posts, so I thought I’d share some photos of another one of our goat toys. 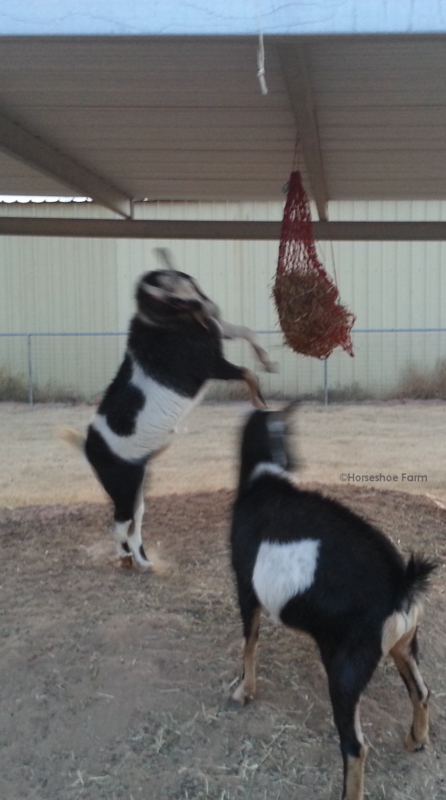 I picked up a Hay Net and hung it from the roof of the shade structure out in the pasture. 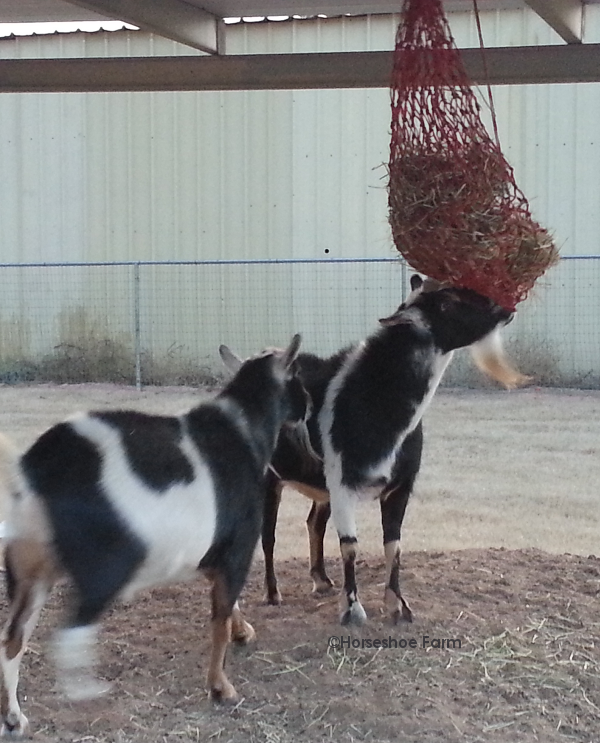 It’s like a piñata for goats! They absolutely love it. It also helps to slow down their eating, and keeps the hay up off the ground, nice and clean. My wethers have to work a little harder for their hay with this instead of just standing there devouring it, which is good. If you decide to try this, use caution. 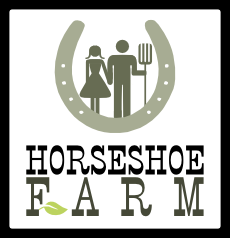 The first hay net I picked up had 4″ holes. 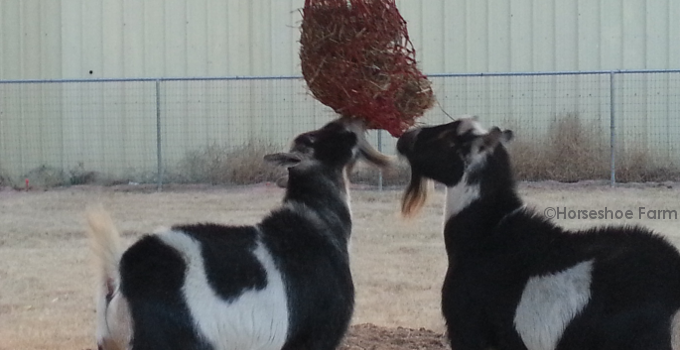 Within about 30 seconds of hanging it, all of the hay had dumped out onto the ground and one of the goats had his head stuck in it. I don’t know why I didn’t see that coming. Fortunately, I was watching them and was able to free him before he injured himself. That hay net was returned the next day, and I picked up this one with 2″ holes. It holds in the hay much better, and so far I haven’t had any issues with goats getting stuck in it. I hung it up pretty high so they can only reach the bottom of it, and I don’t leave it out all the time as I’m sure they’d eventually chew a large enough hole in it to get their heads stuck. I’ll fess up I’m totally goat stalking you!! OMG are they too cute!! I’ve wanted a goat for as long as I can remember and at 52 that’s a long time!!! The fact that our daughter developed my love for goats is not shocking at all!! She’s one lucky “girl” a lucky wage earning, multi job holding “girl”, why?? Bc she only had to wait approx 25 years for her goats, that’s why!! The only reason I’m not hugely jealous is bc she lives fairly close and I goat stalk her sweet boys very often!! Bc I love my gran-goats I’m always on the lookout for something fun for my boys! I just happen to have a few of those huge water bottles and when searching for “goat toys” what pops up but your post. So any secrets I/we should know before heading over perfectly useable water bottles, like I’m guessing we shouldn’t leave the screw on lids on? My gran-goats are pretty smart and I’d guess it wouldn’t take long for them to remove them. Our bottles have the white flat screw on lids, no glue or paper are on the bottles either. They have a jungle gym to climb on and they do climb! They at one time had a few huge plastic barrels but the smarty pants learned to flip them over to escape their “area”, which for two goats is plenty large enough and they free range/free wonder the entire gated pastures/yard, that has shelter and such. Our daughter works nights and was suddenly woke mid day by two smart goats who escaped their area only to welcomes themselves to her nice and warm bed via the dogs doggie door!! Ha as well as once coming inside to rest/chill on the sofa in the den!! Ok I’ll stop my ramble here, but seriously I could go on and on about these cuties!! Lucky for me I’ll be “mini farm sitting” a few days late this week and most of the following!! Oh how I so can’t wait bc I get them all to myself!!! Sorry again for my novel, I have major goat envy of your goats a well!! Have a great rest of the weekend!